Sometimes you must act immediately. You have to drop everything and act before it’s too late. I was engaged to a woman for a week, prior to my relationship with Heather, that ultimately resulted in marriage. The one-week engagement woman could not say, “Yes!” until it was too late. She took two long months to get off the fence and finally say yes. I gave her a deadline for saying yes, and she couldn’t. On Deadline Day, I said it was over and began dating Heather. Then she was ready to say yes. So I said yes back. For a week. I was in agony about her reluctance to say yes. In fact, her yes was less than enthusiastic. I asked my parents what to do. They wisely would not advise me, other than to say, “Just listen to yourself.” I did – and I had to call it off. The window of opportunity for the first woman was lost. 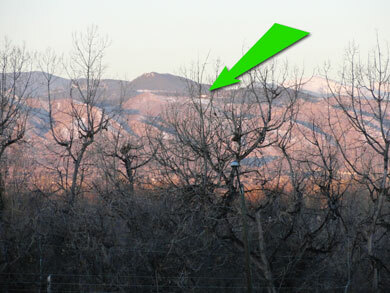 The photo is a very weak capture of a moment… This is the morning view of the foothills, visible from our front porch. Occasionally, you can see the morning sun‘s reflection in the mirror-covered glass of a distant office building. On a recent morning, there were about ten shiny windows. I had never seen more than one. And it looked like sparkly Christmas lights. Sadly, my camera was not up to the duty of capturing the moment. I remember those days. You made a good choice, and things worked out well for the other lady as well. It is very helpful to let ourselves really feel our feelings and discover what we really believe. Tim, you made a very good point that I left out. That “other” lady ended up marrying a man who was much better suited to her! Last I heard, they were happy and have two kids.